Steve Severance submitted this one, which shows a group of second-generation Blue Stars after their Division III award ceremony last Saturday afternoon. Left to right Nicole Anthony (guard), Jon Severance (front line), Deandra Christianson (guard), Tyler Anthony (soprano). 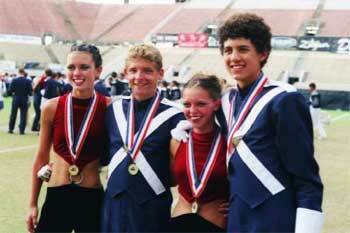 "All four had parents who marched with the Blue Stars in the '70s and early '80s. Nicole and Tyler's mother, Robin, marched in the guard in 1980 and 1981. Jon's parents, Steve and Karen, both were in the Blue Stars brass line for several years and aged out in 1981. And Deandra's mother Dawn was in the color guard from the early 1970s to 1979. Of course they (the parents) were all there in Orlando this year to witness the show and their kids receiving the gold medal!"